Immortal Cities: Children of the Nile is one of the older city building games available but don’t let the age of the game turn you away. 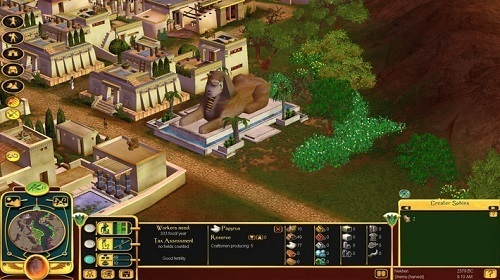 Children of the Nile was developed by Tilted Mill Entertainment and released for Windows in 2004, with an expansion pack (Children of the Nile: Alexandria) and online spin-off (Nile Online) released later. The game is a pleasant city building experience with great attention to detail and is definitely one of the stand out games in the genre. Players take on the role of the Pharaoh as your Egyptian civilisation grows through several thousand years of history from a simple tribe to the immortal civilisation and pyramids that Egypt is known for today. Every single person in your city has their own story, family and household which gives the game a realistic feel compared to other city building games. The AI also controls each of your citizens perfectly to add to this realism. As Pharaoh you have to meet the various wants and needs of your people while also opening up various trade routes and defending your city when necessary. 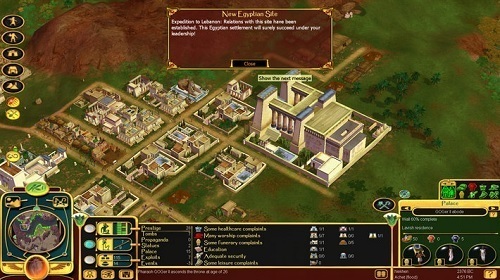 The gameplay on offer in Immortal Cities: Children of the Nile always promises something new, so you’ll easily get lost in the massive game world. Immortal Cities: Children of the Nile is one of the best historical city building games available and is still a great purchase despite the age of the game. You’ll quickly fall in love with the graphics, soundtrack, interface, villagers and everything else that the game has to offer. Create the ultimate Egyptian civilisation. One of the great classic city building games. Includes an extensive campaign and map editor.